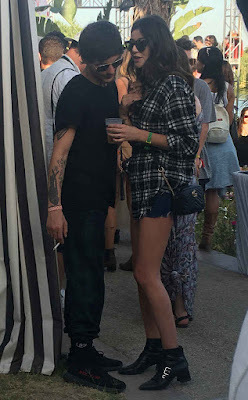 Home / Unlabelled / Louis Tomlinson and girlfriend Eleanor Calder were spotted hanging out at the Revolve Festival party at the Merv Griffin estate in Indio, Calif.
"Louis Tomlinson and girlfriend Eleanor Calder were spotted hanging out at the Revolve Festival party at the Merv Griffin estate in Indio, Calif. An insider told us they sat at a cabana by the pool, pouring themselves a CIROC and Red Bull drink. 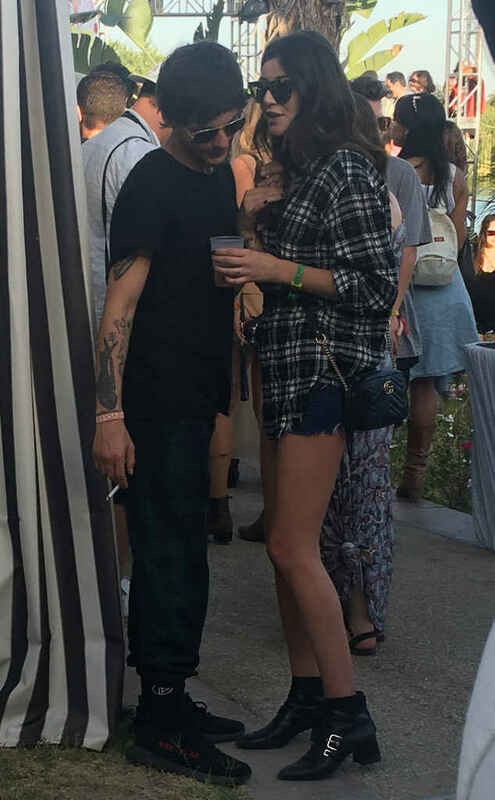 The former One Direction singer donned green flannel pants and a black shirt, while his on-again, off-again girlfriend opted for a plaid black and white button down and denim shorts. Though the couple didn't show too much PDA, they did spend a bit of time chatting together by themselves. Sofia Richie, Nick Jonas, Joe Jonas,Sophie Turner, and also attended the event. Nick was spotted smoking a cigar and holding a goblet of Moët champagne in his private cabana beside Tomlinson. He donned a head-to-toe army fatigue outfit and a tan baseball cap. Joe and Sophie sipped on fruity drinks and chatted with friends.